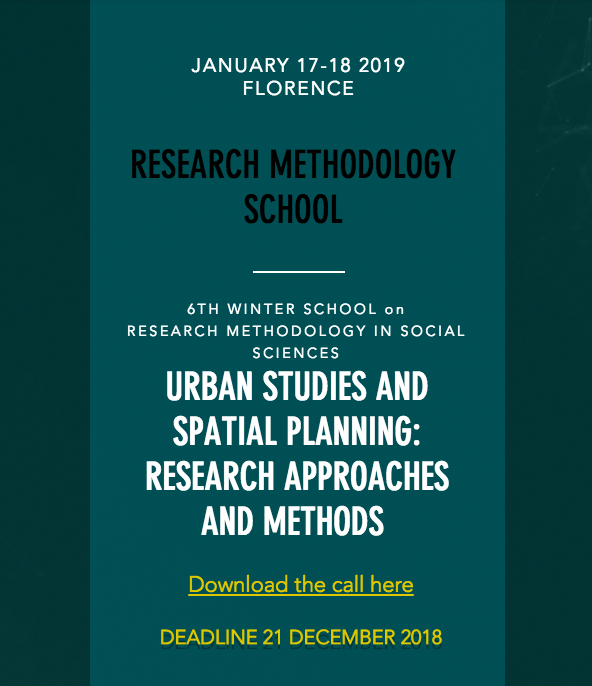 A network of scholars from a number of Italian universities, engaged with doctoral courses, have voluntarily set up a PhD learning project on research methodology in the field of planning and urban studies. This is a sort of "research methodology school" that offers graduate students, PhD candidates, young academics and scholars affiliated with doctoral programs the opportunity to interactively build learning and training paths in research methodology. 1 | Register by 21 December 2018 on the Winter School website. 4 | Fill the Questionnaire to select the scholar you want to meet during the "Pint of Research"
When registering at the Winter School, attendees are required to specify the following details: name, surname, affiliation, role; which workshop among No. 1, 2 and 3 they would like to attend; if they'll join us for meals (two lunches and a social aperitif/light dinner); which researcher they would like to meet during "Pint of Research". The Winter School will be held in English and will provide students with 6 credits (to be agreed with the sending universities). Participants will also be given of an additional certificate of attendance of activities related to the "Complementary Skills", issued by the IUSAFF (Istituto Universitario di Studi Superiori dell'Ateneo di Firenze) equivalent to 6 credits. Basic questions will be addressed in this section, including: how to write an academic article or a PhD Thesis, and, how to publish in international scientific journals. 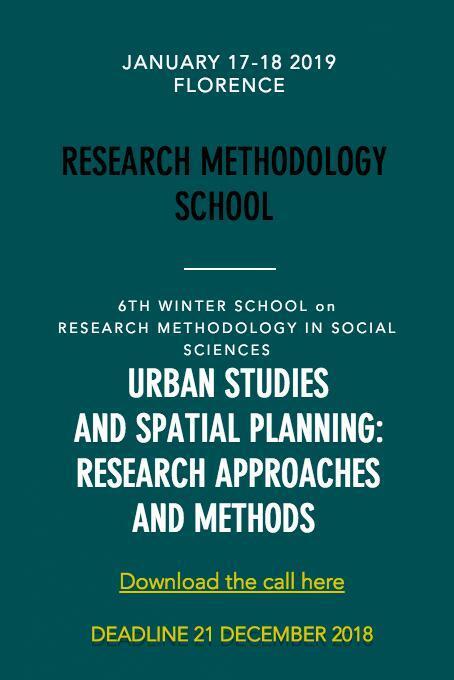 Parallel workshop will be offered, addressing topics including: questions related to methods of qualitative and quantitative research and to the research-action approach, and, the challenge of working with comparative approaches beyond the stereotyped 'divides' that have influenced international research (north/south divide; formal/informal etc.). We will address: an overall strategy to integrate the different components of a qualitative study and effectively address the research problem. We will address topics including: questions about what research design is and what it is not, how to make sure all parts are properly in place before "tightening", and why are you thinking of doing a qualitative study of the topic chosen. We will address hot topics in the field of planning and urban studies this section. Two leading scholars in the field will give a talk addressing their approaches to the topic and their methodological perspective. Inspired by "Pint of Science" (an initiative started in 2012 by a group of UK based postgraduate and postdoctoral researchers), "Pints of Research" will be offered as an opportunity to meet researches in an interesting, engaging and approachable way: a number of Italian scholars are available for "beer-to-beer" meetings over a beer, a glass of wine or a soft drink, with a limited number of PhD candidates and young academics for exchange and tutoring activities.